WINNIPEG – Kenyan student Japhlet Lolo said he loved “Friendly Manitoba” shortly after arriving in the city during the winter of 2016. After winning an award yesterday from the Manitoba Council for International Education (MCIE), he loves it even more. Manitoba is the place to go for studies because of the quality of education and the rich cultural diversity. I am thrilled to have received this award which affirms I am doing the right thing! I hope this will encourage other international students to come to “Friendly Manitoba and get engaged in the Manitoba community. International Education Week is celebrated in more than 100 countries around the globe. 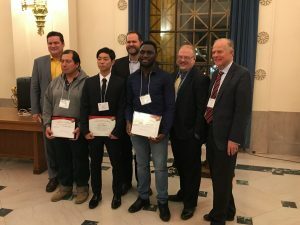 A reception was held yesterday for members of the international education community, current and former international students with the Honourable Minister of Education and Training Kelvin Goertzen. 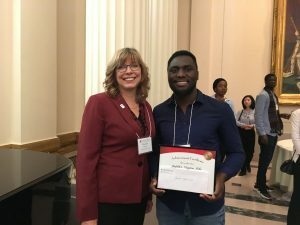 Michelle Romuld, chair of the International Student Awards Committee of MCIE, says “Japhlet’s nomination for the MCIE International Student of the Year (post-secondary category) award stood out for several reasons. The fact that he has been able to maintain an above average GPA and a part-time job in addition to his on and off-campus commitments – including being nominated to student council and doing local charity work – all while adjusting to life in a new country is very impressive. Japhlet has embraced every opportunity to immerse himself in his new community and appreciates all that Manitoba has to offer. Last year, Booth University College welcomed 66 international students from all over the globe; the highest number in Booth UC’s history. The richness and diversity it has added to the campus are welcomed. From the variety of languages spoken to the first-ever multicultural night, the benefits are endless. Rhonda Friesen, dean of student services, says, “The influx of international students over the past few years has had a significant impact on Booth UC. While international students seek out Booth UC for our academic programs offered in a supportive community environment, they are also enriching our campus with new perspectives and cultural connections around the world. We are so encouraged to see students such as Japhlet become fully engaged members our school community because we learn from them and are made better for their enthusiasm, wisdom and courage. William and Catherine Booth University College was established in 1982 in downtown Winnipeg. A private university college with open enrolment, Booth University College is a Christian university of choice, anchored in academic excellence and based on a vision of social justice, hope and mercy for all and committed to “Education for a Better World.” Click on https://www.boothuc.ca/ for more information.